All of the amazing toppings on a loaded baked potato in one hot, glorious dip! 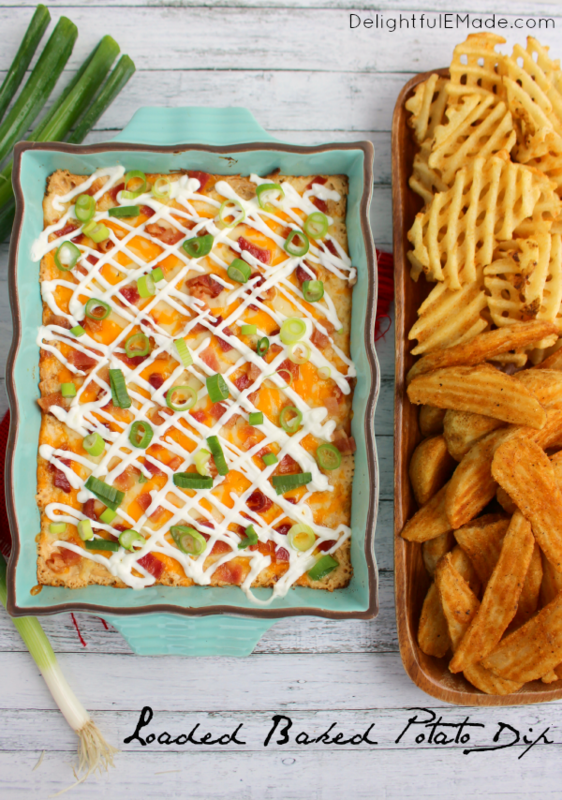 Served with potato wedges and waffle fries, this hot, cheesy appetizer is one that everyone will love when watching the big game! As many of you know, we are big football fans in this house! We love watching college games on Saturday, and pro games on Sunday, and of course the Thursday, Friday and Monday night games as well. It seems there’s always a game to watch come fall, and I’m not complaining. 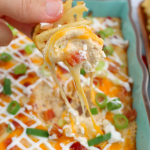 With great games, comes great food to go with them like my Loaded Baked Potato Dip! 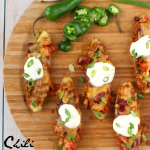 Great appetizers and football seem to go hand-in-hand. 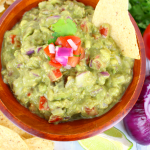 Really great dips are perfect to make, especially if you have friends coming over to watch the game. 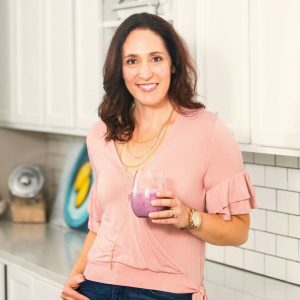 It’s no-fuss, eat as much as you want kind of food, which I personally LOVE! 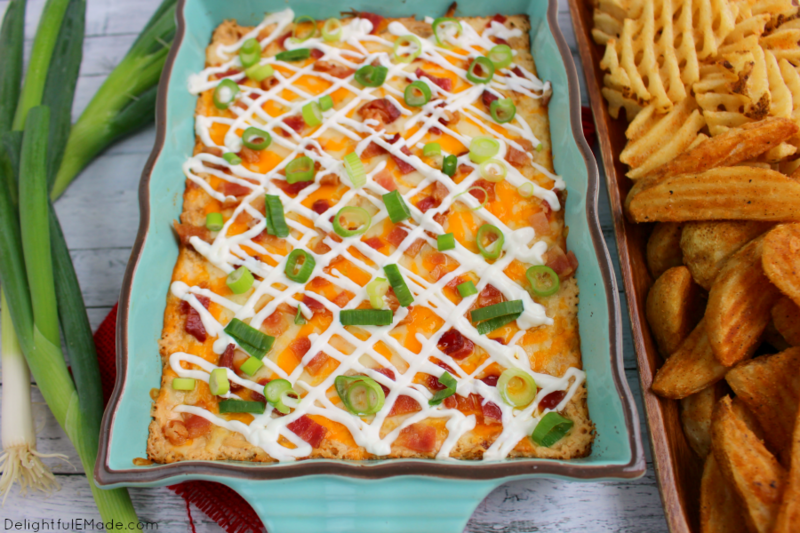 To make this fabulous dip, I made my way over to my local Walmart where I picked up a few boxes of Lipton Recipe Secrets Onion Soup & Dip Mix. These mixes are staples for making awesome dips, and make for the perfect seasoning base for a wide variety of dip recipes! 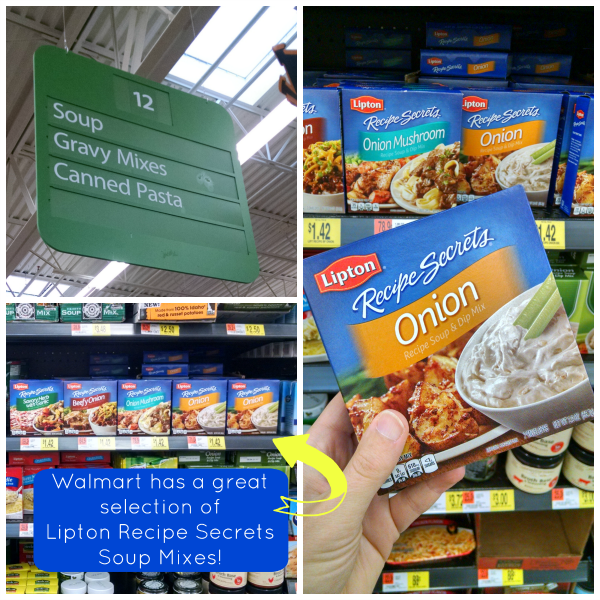 Walmart has a fantastic selection of Lipton Recipe Secrets Soup Mixes – you can find these in the soup aisle. In addition to the Recipe Secrets Onion Soup mix, I was also able to pick up all the other ingredients for the dip, like the cheese, sour cream, cream cheese, bacon, onions, and the potato wedges and waffle fries in the frozen food section. Walmart really is a fantastic on-stop-shop for all of your football food staples! 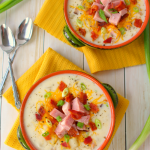 Get a coupon for $.60 off any 2 soup mixes by visiting this link and then stop by your local Walmart to pick up Lipton® Recipe Secrets, located in the soup aisle. 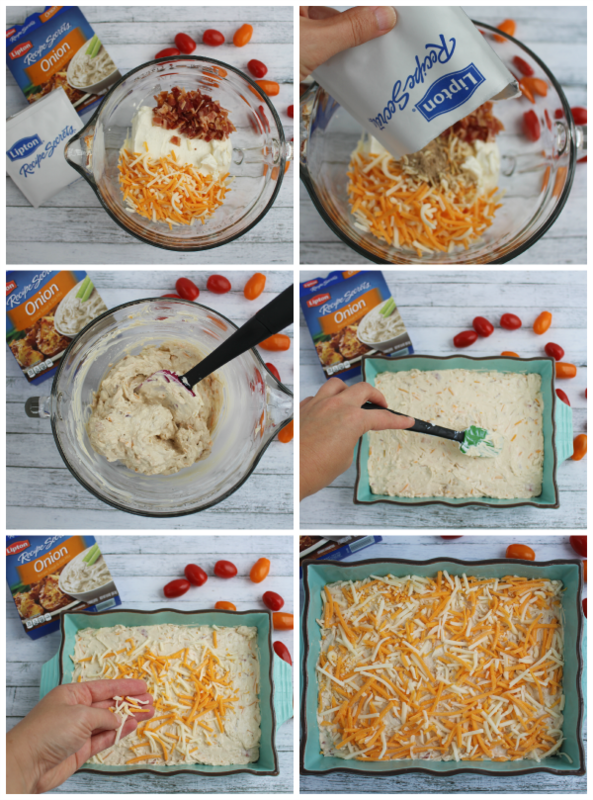 Mixing up this dip is simple and takes just a few minute to get it into the oven. 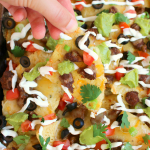 Perfect to make before the game, or during half-time for a great snack! This creamy dip comes together quickly and easily. You’ll start with a base of cream cheese (room temperature), sour cream, shredded cheese, bacon and a packet of the Onion Recipe Secrets Soup Mix. (Pretty good start, am I right?!) Stir this together until fully combined, and then spread it into the bottom of a medium-sized baking dish. This dish is a 9×7, but you could use round, oval or even a medium-sized cast iron skillet. 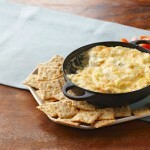 You’ll then bake the dip at 350 degrees for about 20 minutes or until the cheese is completely melted on top. Once it comes out of the oven, top with additional sour cream, chopped bacon and green onions. All your favorite baked potato toppings in one hot, glorious dip! This dip pairs wonderfully with a big stack of potato wedges, steak fries and waffle fries. You’ll end up with all the great flavors and textures of a loaded baked potato in one amazing bite! 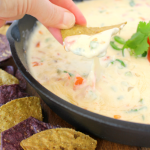 Serve the dip right away to enjoy the amazing melted cheese, and the wonderful creamy, onion flavors below! All of the amazing toppings on a loaded baked potatoes in one hot, glorious dip! 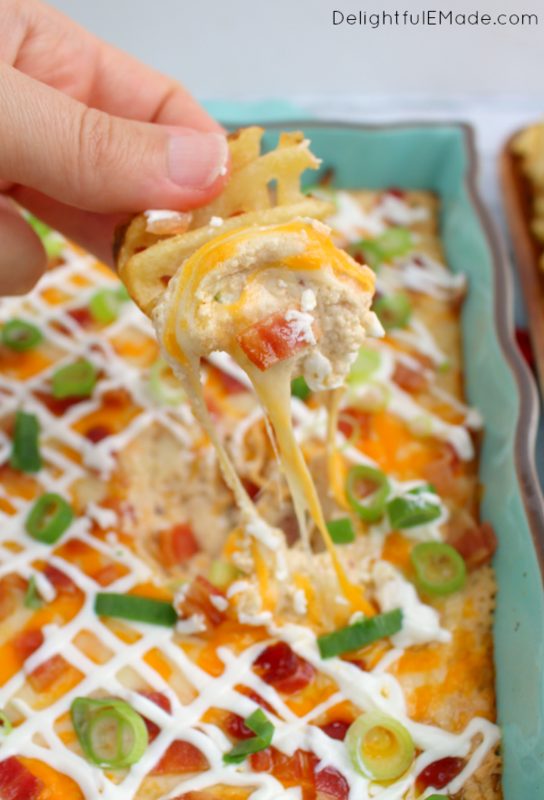 Served with potato wedges and waffle fries, this hot, cheesy appetizer is one that everyone will love when watching the big game! Perfect for parties and holiday gatherings, too! Preheat oven to 350 degrees. Spray a medium baking dish (like 9x7") with nonstick spray and set aside. In a mixing bowl, combine the soup mix, cream cheese, sour cream, 1 1/2 c. cheese, and 3 slices of chopped bacon. Stir until all are creamy and combined. Spread into bottom of prepared baking dish. Top with the remaining 1/2 cup of shredded cheese. Bake at 350 for 20 minutes or until cheese is completely melted. 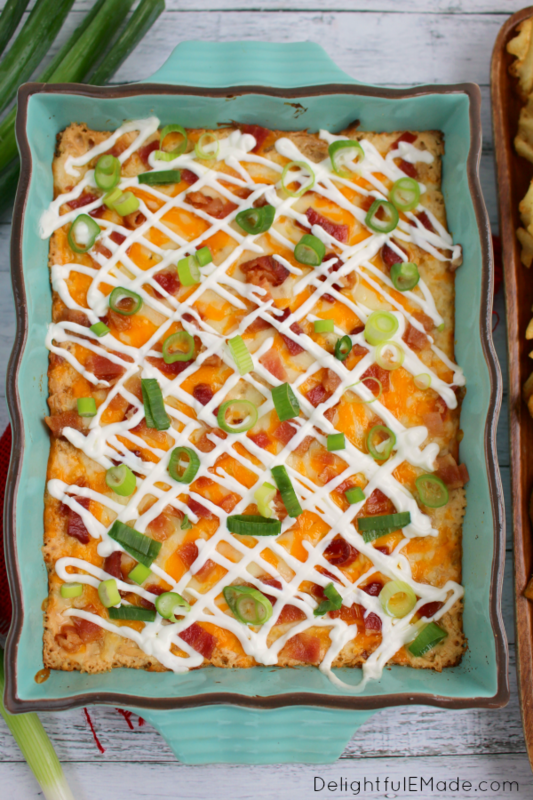 Remove from oven and top with the remaining chopped bacon, drizzle with additional sour cream and top with green onions. Serve with hot potato wedges and waffle fries. Enjoy! Potato...cheese...say no more, I'm sold! This looks fantastic! 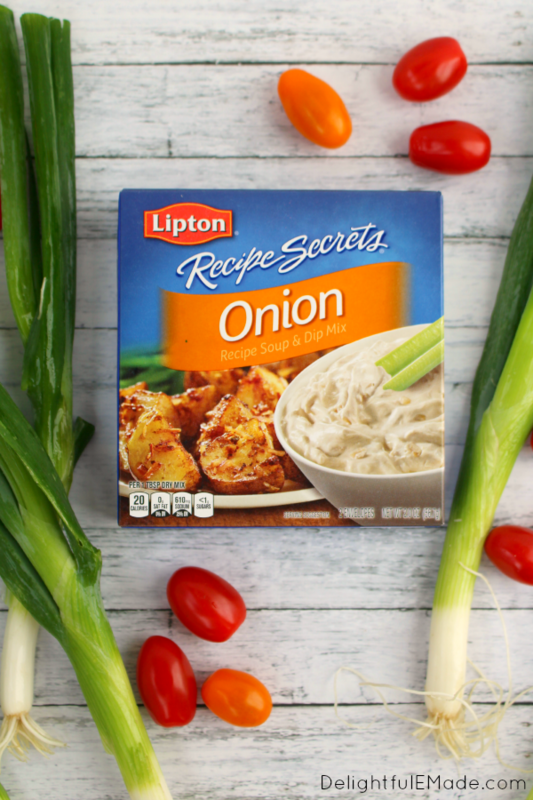 We love Lipton Onion Soup Mix! I will be making this one for sure - and so perfect for football season! OH MY GOODNESS! This looks like heaven in a pan. I absolutely love potatoes of any kind and hadn't thought about enjoying them in a dip. What a great way to add a little healthy snack to my next tailgaiting party. (Potatoes and onions are vegetables so that's healthy right?) Thanks so much for sharing! Yum! I love the idea of dipping potato wedges in this. It would be a perfect Super Bowl party dish, but I don't think I can wait that long to try it. Pinned and sharing. Thanks for linking up at Family Joy Blog Link-up Party this week!